This gentle, funny story is a good one to adapt with puppets. You can play up the gentleness for younger audiences, like in Toddler Time, and get sillier with older, preschool age groups. When Baby Mouse says “Mother, mother, I want another,” his mom thinks he means another mother, when he really wants another kiss. This sets up the main action of the story: a series of other animals come and try to be “another mother” for Baby Mouse. Each one sings a silly little song, but Baby Mouse always ends up repeating the title refrain. The songs are four lines that I just sing to the tune of “Twinkle Twinkle Little Star.” Mrs . Duck sings “Quack, quack, mousie, / Don’t you fret, / I’ll bring you worms / Both fat and wet.” I tend to silly the songs up a bit: “Quack, quack, mousie, / Don’t wiggle and squirm, / Tomorrow you can eat / A bunch of worms.” You can use just about any puppets for the other mothers and make up rhymes pretty easily. Like for Mrs. Skunk: “Hush little mousie / All is well / Think of the nice things / There are to smell.” (turning her tail to him at the last line). You can have some fun with the voices of the mother puppets, but no need to be too extreme with them....just a little croak to your voice with Mrs. Frog, a deeper voice for Mrs. Cow, that sort of thing. What they're doing is more important than how they sound in this case, so putting a lot of energy into unique voices is more distracting than helpful for this story. When Baby Mouse finally explains what he really wants, each other mother returns to give him a kiss. Baby Mouse’s reaction to each kiss is happy in the book, and that’s how I do it with toddlers. But for preschoolers, I usually have him react to the kiss more rudely: “Ick! I’ve been kissed by a frog!”…that sort of thing. The way Baby Mouse says the “Mother, mother, I want another” refrain can also vary by audience. With preschoolers, he can get more impatient with each one (shown by voice and by more motion, as inmoving towards the mothers while they move back), while with younger kids his response is more mild and consistent. There’s a bit of puppet management to this one, since each mother tells the next one about Baby Mouse’s problem, then the new mother goes to see Baby Mouse. So I have the mother puppets split up on either side of me. And before each switch, Baby Mouse comes off the hand on rests on my lap. So Mrs. Mouse (right hand) leaves Baby Mouse (left hand, then lap). Mrs. Mouse meets Mrs. Duck (left hand). Mrs. Duck comes to Baby Mouse (right hand now). Mrs. Duck leaves, meets Mrs. Frog (right hand)…etc. Then you also have to return each mother to alternate sides when you take them off, so they’re easy to pick up when they return (in reverse order) for the kisses. Writte out, it looks way more complicated than it really is, but it is worth walking through with the puppets a time or two before telling. I am gathering puppets right now so I can practise this for my Storytelling at the county fair in a few weeks. Thanks for your wonderful suggestions! 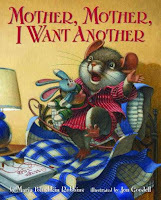 Finally, I did "Mother Mother I want another" at storytime today, and the crowd of 3's and 4's loved it. I found a little box and made a bed for baby mouse so that I could keep that in my lap while the Mother mouse and other mothers come to sing to baby mouse. Great fun, thanks Steven!